Dressed in their finest millinery, a group of well-wishers got together and raised a glass to celebrate the wedded bliss of an American actress and her handsome British prince. Following British tradition, young children – six bridesmaids and four pageboys – made up the royal wedding party for Prince Harry and his American bride, Meghan Markle, when they tied the knot on May 19. 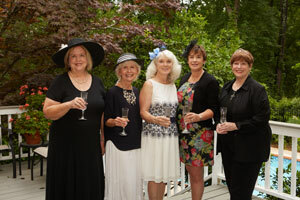 To celebrate the happy occasion, however, Evans resident Susan Salisbury had a royal wedding party of her own. She invited 25 or so of her friends and neighbors to her home for brunch on the morning of the wedding to toast the newlyweds. The ladies were free to watch the early-morning exchange of vows at home in their PJs. However, they donned their finest millinery – ranging from a tiara to fascinators, of course, to wide-brimmed hats – for the party. Susan says she loved seeing the couple’s strong bond and welcomed the fact that Harry chose a bi-racial American actress from Los Angeles to be his wife. She appreciated the historical significance of the nuptials for another reason as well. To celebrate the occasion, each guest brought a dish for brunch, and the fare had to represent British or California cuisine in honor of the couple’s roots. Prizes of British shortbread also were awarded to two lucky ladies for the best fascinator and the best dish, which were determined by popular vote. Pat Rickerson claimed the prize for best dish with her made-from-scratch lemon elderflower cake. Harry and Meghan, who were given the titles of Duke and Duchess of Sussex by Queen Elizabeth upon their marriage, also served a lemon elderflower cake at their wedding reception. 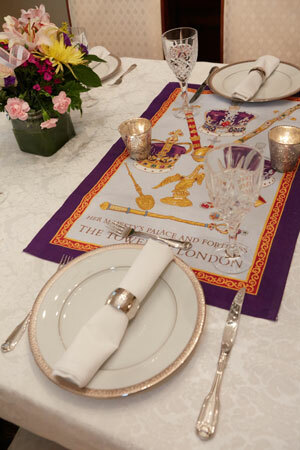 With a menu that was fit for royalty, other dishes included eggs drumkilbo with lobster, British trifle, scones, clotted cream, marmalade, fruit salad, quiche, California rolls and cucumber bites. Some guests served their dishes on English bone china or family heirlooms, and all of the ladies gave a brief explanation of the food they brought before brunch was served. Catriona Yeudall, a native of Scotland who has lived in the United States for almost 20 years, made Scottish oatcakes with smoked salmon. She expects Meghan to bring a “breath of fresh air” to the royal family. After first toasting the queen, naturally, Catriona also gave a traditional Scottish wedding toast to the couple before the ladies sat down to eat. While Catriona represented the United Kingdom with aplomb, Sandra Bednarz was the “Northwestern connection” at the party. Her son attends Northwestern University, which is Meghan’s alma mater. Sandra made bacon-wrapped dates, which are a popular appetizer at Celtic Knot Public House, a pub and restaurant near the Evanston, Illinois, campus that is popular with Northwestern students. The dates also were a nod to Meghan’s California girl background. Monica Dainer made Markle Sparkles cocktails, a combination of elderflower liqueur and French champagne, for the festivities. “Susan christened the drink. We put blueberries in the bottom of the champagne glasses since we didn’t have elderberries,” Monica says. She bought a plain white fascinator for the occasion and dressed it up by added blue feathers and a sparkly pendant to match her blue and white dress. She even wore Essie “Ballet Slippers” nail polish because she had read that the shade is the only one Queen Elizabeth wears. She also brought extra fascinators for other guests, if needed. 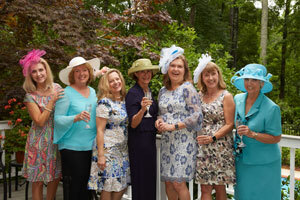 The ladies showed her lots of love for her fashion choice, voting her the winner of the best fascinator contest. 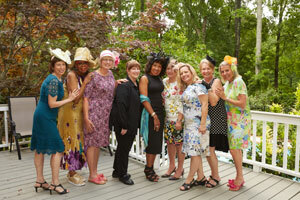 “Everybody brought their own sensibility to the day,” Susan says. Published on June 28, 2018 in People.